Spread all over the archaic civilisation, branched out till the Late Middle Ages and Romanticism, building rituals are based on the fundamental moment of the Divine sacrifice, completed at the Creation of the World. Mircea Eliade dedicated to them two studies , from which we shall start in order to sustain a self-contained analysis of the spiritual mechanisms of the founding myth. The divine sacrifice of an originator god was well known in all religions and mythical cosmogonies, including totemic beliefs – asserts Mircea Eliade. But in spite of their large spreading, they had produced self-contained literary works – observes the brilliant scientist – only in South-Eastern Europe, which is a sign that the Balkan-Carpathian peoples’s family had resonated in the best way with the message of the archaic myth. The belief in the immortality of the soul was a premise for the fact that the sacrificial act, fulfilled for the benefit of the collectivity should not be disclaimed, but accepted like an act of liberation, generating ethnicity and everlastingness, exalted by collective memory and polished into literary works of a unique artistry. 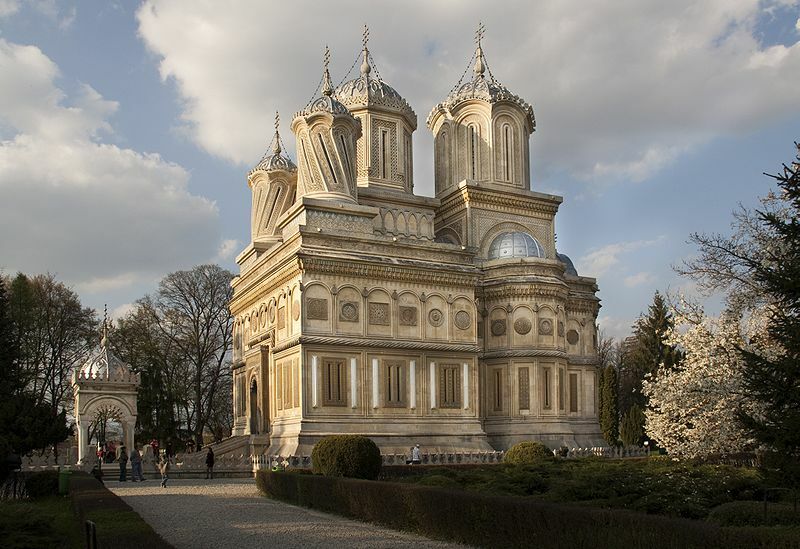 Eliade’s argument asserting the masterpiece status of the Romanian ballad “The Legend of Argesh Monastery”, based on the comparative study of the whole Medieval Europe’s thematic literature, relies on this fact. “The Legend of Argesh Monastery”, also called “Master Manole” is one of the most appreciated Romanian popular epic poems, one of the “trademarks” of Romanian spirituality. It has been published in 19th century and immediately included into the most important international folklore compendia. 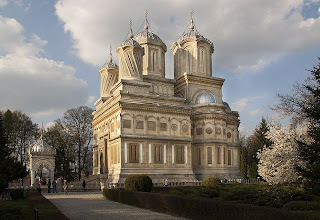 Nine stonemasons and their master Manole were finding a place to build a monastery, ordered for his memorial by the Wallachian prince Negru Voda. Because an unknown reason, the walls of the new building were continuously collapsing. In a prophetic dream, Manole was advised to bricken into the wall the first woman coming to them. It happened that Manole's wife Anna showed up. So the craftsmen had to keep their vow and immure her alive within the church walls. Thus the monastery could be finished. The prince was pleased by the beauty of the monastery, but he ordered to remove the ladders, and so Manole and his craftsmen remained out-of-the-way on the roof. In an attempt to escape, they made themselves pairs of wings from shingles and tried to fly from the roof, but all of them crashed to the ground and transformed into stones, while on the place where Manole had crashed, a well “with bitter and saline water, watered by tears” (as the ballad sings) has spring out. In one of the versions Manole nails the wooden shingles to his arms, prefiguring the Crucifixion and revealing the Christic essence of the hero. “As well as Jesus, Manole has a sacerdot’s role, he sacrifices and is sacrificed for the sins of the others” (S. Ispas, 2001, 161). The Legend of Argesh Monastery is the most prolific from all Romanian folk literature; it inspired generations of literators and artists and has been studied by numerous specialists . Its exceptional value among other building legends from other cultures, as specialists assert , consists in the sacred character of the edifice – a church – and the Christian meaning of the sacrifice, as it is suggested by the poetic text. But the building myth had literary crystallized also in the Transcaucasian area, another crucible of races and religions that had preserved its archaic dower. The Legend of Surami Fortress is a definitory literary work for Georgian ethnos. Its absence from the worldwide folklore compendia is evidently a consequence of the symptomatology of “small cultures”. The action of the legend takes place in the end of the Middle Ages, when, after centuries of resistance, the lands of South Georgia were incorporated into the Osman Imperium and converted to Islam. The Muslims continued to press upon the country. Apostasy was perceived as a collective tragedy, eroding the foundations of the nation. The folk productions of the times were sorrowfully expressing this feeling. 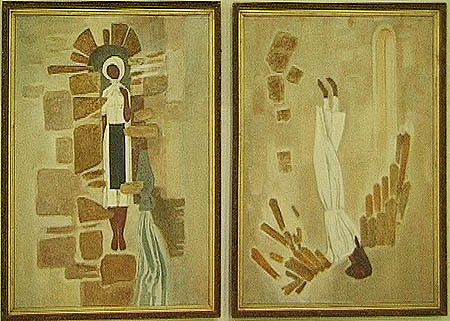 Inspired by the patriotic and religious message of the legend and starting from the literary transcriptions of Daniel Cionkadze, Niko Lordkipanidze and David Suliashvili, the armenian film-maker Serge Parajanov transcribed the legend into a cinematic ballad: The Legend of Surami Fortress , a heroico-poetic drama, produced by Gruzia Film in 1984. The film is dedicated to “the memory of Georgian soldiers from all the times, who gave their lives for the freedom of their fatherland”. The Legend of Surami Fortress synthesizes the socio-historical scene of the epoch in the frames of an epopee, going off through three generations. The tragedies of an unfulfilled love and of two lives fallen into apostasy are interleaving around the main plot: the raising of Surami Fortress. The fortress defends the city of Surami and assures the security of the fatherland. But from unknown reasons the fortress cannot be erected. The feeling of collective damnation is hovering over everyone. What should be done in order to regain the Divine willingness? From the ashes of great disasters, after three generations, a saviour will rise. We briefly relate the subject of the movie, in order to emphasize the spiritual landmarks of the plot. Tbilisi. The Great Prince orders the building of Surami fortress. Young Durmishkhan loves Vardo and wants to marry her, but both are serfs, depending on the benevolence of their lord. Their Lord liberates Durmishkhan, who leaves into the word to gain money to redeem his beloved. Vardo has the gift of foreseeing and forebodes that Durmishkhan would never return. Reaching the Turkish land, Durmishkhan befriends with the merchant Osman-Aga, a renegated Georgian, who tells him how he ran away from Tartars and slavery, changed his faith, his speech and became a merchant. But he cannot forgive himself the renunciation of the law of his ancestors. Under his protection, Durmishkhan also becomes a merchant, marries a Turkish woman and has a son: Zurab. Vardo leaves home to find her beloved. Her prayers for his coming back are not accepted. A fortune-teller shows her Durmishkhan’s live. After the fortune-teller’s death, Vardo takes her place. Osman-Aga leaves his trade business and rebaptizes, in order to repatriate to Georgia, but the Muslims assassinate him. Familiarized by his teacher with his ancestors’ spirituality, young Zurab enters into the service of the Great Prince of Georgia. From the fortune-teller Vardo, Zurab finds out the price of the Surami fortress’s rising: he must let himself bricked up into the citadel’s wall. The young man happily fulfills the prophecy. The Fortress is finished and the Great Prince orders the people to prostrate before Vardo, the spiritual mother of the martyr. We shall not pass in revue all the varieties of the Georgian legend, nor of the Romanian one. Our task is only to reveal the Christian essence of the founding myth and its corresponding rituals and literary productions, that are mostly considered to belong exclusively to the pagan-totemic culture and Weltanschauung. Therefore it is not so important whether the two paradigmatic examples chosen here belong to the popular, anonymous literature or to the cultivated one, subsequently rearranged by the cinematic art: both have suffered certain, more or less long, more or less complex stylisation processes, in order to reveal the essence of the myth. All the heroes of the legend seem to lie under a curse. All their lives suffer of bad luck. Their prayers are not accepted. Even God seems to have turned His face back from them. And so it is: apostasy attracts God’s curse. In a country convulsed by aggressive pagans, the weakest surrender, but the sin of apostasy spreads over the entire community. That’s why peoples’ prayers are not accepted, loves and destinies come to nothing, and the fortress cannot be raised. The curse hovering over Vardo is a part of the collective curse of the whole nation. Renouncing to her destiny, Vardo will guide other’s fortunes, until her road would meet that of her alter-ego (her ex-fiance’s child) and through him with the destiny of the nation. Prophets and fortune-tellers have no own destiny, they are devoted – to God or to Devil: whom will Vardo finally choose? Endorsing since his childhood his teacher’s lesson of patriotism and faith, Zurab is prepared for the proof of supreme sacrifice. The leitmotif of the unfinished wall is torturing the country since two generations, the curse must be overcome. Zurab fulfills his task with serenity. Under the wall hiding the young man’s body his spiritual mother lays a patch of blue tissue: a piece of heaven – here is the sign that the divine order has been fulfilled. The sacrificer is also sacrificed, her destiny, broken on earth, fructifies through the Cross, according to the Marial archetype. The martyr’s love thaws out the silence of the Heaven and eventually opens the windows of the country towards God. Like in a new Creation day the Great Prince orders “There shall be light!”, proclaims the close of the mourning and the beginning of the great feast. 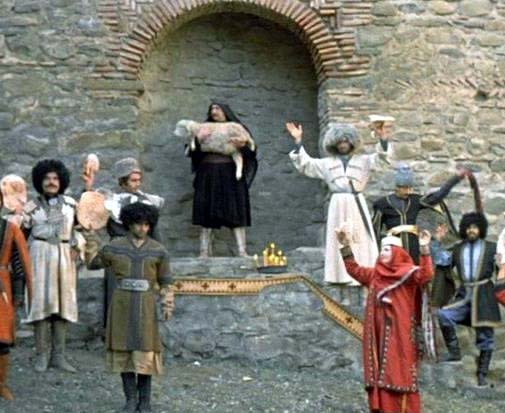 The Legend of Surami Fortress, read by Parajanov, fortunately stands out from the alterations of the creationist archetype, present in most of the building rituals. It’s not the sacrificed body of young Zurab that offers ex-officio perennialiy to the fortress, but his voluntary and total participation (moral and physical) to the fortress’s rising and the salvation of his nation. This idea is clearly emphasized by the filmmakers, by quoting an aphorism of a maximal limpidity and sharpness: “If a nation has a young man who is capable to voluntarily immure himself in the walls of a fortress, that country and its people are invincible (Niko Lordkipanidze)”. The exceptional quality of the legend cinematically transposed by Parajanov, which distinguishes it from most of the other legends on the same topic, elevating it from the stage of pagan rituals to the altitude of Christianity is the voluntariness of self-sacrifice. It is true, the filmmakers adapted the most known version, of Niko Lordkipanidze, where the sacrifice of the young man is unurged; in other versions the immurement is decided by another person or is a matter of revenge. 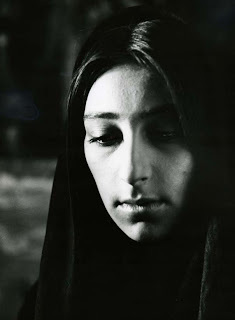 Parajanov had chosen the most ethically elevated version, the only one falling under the Christian paradigm and ultimately, the only one capable to give birth to a masterwork. In most of the building legends – Mircea Eliade asserts – the subject of immolation is chosenby the craftsmen’s team after a visionary dream or a premonition and is sacrificed either without its willingness, by cheating or by force. It is therefore a victim and not a martyr; the human been, while not voluntarily participating to the sacrificial act, or even opposing to it, is treated at the level of its primary, animalic level and at the same level is the result: the building stands, but does not get the Divine benediction; being not the fruit of devotion and love, it doesn’t become a vessel of the Grace. An offering that is not motivated by love doesn’t penetrate into eternity. “And though I bestow all my goods, and though I give my body to be burned, and have not charity, it profiteth me nothing” (I Cor. 13, 3). Mircea Eliade’s explanation, irrespective of the cultural field to which it is applied (Christian Europe or totemic civilizations), is retrieved from the mechanisms of magic and animism: in order to last, the building has to “absorb” itself a soul (M. Eliade, 1991, 416). But “souls robbery” is a matter of… black magic. From this approach, restricted to “magic techniques” and rigid initiating rituals, the building rite looses all its originar elevation, becoming a simple empty form, tributary to satanism. Only the Divine Verb builds for everlastingness, and all that is done in sinergy with God. The Creation of the World is an act of God’s self-offering, issued from love. By consequence, the archetype of Creation (lying at the origin of all building myths) is based on God’s self-conscious and voluntary self-sacrifice. Any good and lasting human creation is made “with the will of the Father, the aid of the Son and the accomplishment of the Holy Spirit” – is written on the frontispieces of our East-Christian churches. The Christianism had substituted the ritual blood sacrifice with the spiritual sacrifice of the humble heart; the only accepted human sacrifice is martyrdom, the supreme measure of love and the confessing imitation of Christ. “Greater love hath no man than this, that a man lay down his life for his friends” (John 15, 13). The builder’s sacrifice begins with his conscious co-operation with God, with the supplication of the Divine blessing. This is the divine-human restoration of the primary archetype of creation. From a Christian perspective, most of the legends based on founding myths have been suffered alterations of the originar archetype, by the ritualistic-mechanical substitution of the offering. When the stonemason is asked for his own life for the lastingness of the building (which means his total spiritual devotion), he answers “by cheating”, substituting the offering with that of another been, not consciously implied in the constructing work, therefore with a simple victim. Hence, he declines a part of his responsibility and spiritual authorship of the edifice, which will also become, from a spiritual point of view, a surrogate. In Eliade’s vision the mechanism of founding rituals derives from the privileged post-mortem status, automatically conferred (as the scientist considers) by a violent death. The heroes of Ancient Greece, for instance, are spending eternity in the sunny Elysian Fields, and not in the kingdom of shadows and forgetfulness (Hades), like ordinary mortals. The motif of violent death is often reiterated by the eminent scientist, however without mentioning the condition of the “victim’s” mental participation to its sacrificing act. Nevertheless, a mechanically executed ritual is nothing more than a vain substitute of the authentic and self-conscious sacrifice, therefore a simple act of magic, and not an act of faith. Its beneficiary is the demon and not God. Self-sacrifice in the name of God (or of a superior moral principle) is the only one that takes “the victim” out from the bloodthirsty arbitrariness and places it together with the heroes and the martyrs: accepting to spend his blood for the others, the hero overcomes death and therefore no more dies. On the contrary, a violent death of an unprepared man – as folk beliefs, Gothic literature and parapsychology handbooks sustain – conserves post-mortem the state of horror, shock and revolt in which death had caught him, [state] which also imprints on the location of the accident or crime. Purifying rituals from all religions (Christian, non-christian and pagan), carried out by priests or shamans on the “malefic sets” where violent deaths had been occurred are determined by this very belief. That’s why understanding founding sacrifice only from a pagan perspective dramatically reduces its dimension and meaning. Only he who consciously assumes death or (corporal) suffering in the name of an elevated ideal, the martyr - an essential figure in all religions - can overcome the horror caused by violence. By the furnace of lurid death, accepted in God’s name, the martyr “consumes his death” since his live time and therefore doesn’t have anymore to die. While for most people (including Christians) death means sleep and forgetfulness (the popular expression “to fall asleep in the Lord” confirms it) and, in the best case, resting (in a place “without pain, sorrow and cry” ), in the case of the martyr, cognition, affect and volition (the three attributes of the psychic) stay active, being even potentiated by the intimacy with God, expressed while his earthly ordeals. Offering his flesh for tearing, overthrowing pain and horror by patience and faith, he overwhelms the bounds of nature, gaining a body of glory. In truth, the martyr isn’t anymore a slave, but a friend and a bridegroom of God. Like to one who had given everything for Him, Christ will fulfill all his prayers. A prototype of the founding hero, the saint martyr has the power to protect the city, the people, the Militant Church. He becomes invincible. As well as Saint George, by excellency his prototype, he is The Victory-Bearer. The blood of the martyrs has been called “the seed of Christianity” , while always martyrdom became an occasion of massive conversions and an extraordinary catalyzer of faith. It is eloquent (and apparently paradoxical) that Church associates martyrs (many of them, virgin-like) with wedding and fertility. In the tradition of ecclesiastical architecture, churches are always built on sites sainted by the blood of heroes and martyrs or are bearing in their core parts of their bodies. But never the blood of some no-account victims of the hazard, persuasion or cheating can be the sustaining matter of the Holly Sacrifice. Comentarii la Legenda Meşterului Manole // Mircea Eliade, Drumul spre centru, Editura Univers, Bucureşti, 1991; and chap. V - Meşterul Manole şi Mănăstirea Argeşului // Mircea Eliade, De La Zalmoxis la Genghiz-Han, Editura Ştiinţifică şi Enciclopedică, Bucureşti, 1980. Like Bogdan Petriceicu Haşdeu, V. Bogrea, Dumitru Caracostea, P. Caraman, Mircea Eliade, Nicolae Iorga, Ion Taloş, Sabina Ispas, Adrian Harghel. Ion Taloş, Sabina Ispas, Adrian Harghel etc. Screenplay: Vaja Ghigashvili. Directors: Serghei Paradjanov, Dodo Abashidze. Gruzia-Film, USSR, 1984. As the Cristian-Orthodox burial ceremonial is saying. 1. Eliade M., Drumul spre centru, Bucureşti, 1991. 2. Eliade M., De la Zalmoxis la Genghiz-Han, Bucureşti, 1980. 3. Ispas S., Povestea cântată // Studii de etnografie şi folclor, Bucureşti, 2001. Fragment from the book: Elena Dulgheru, The Ladder of Heaven in Cinema. Kusturica, Tarkovsky, Parajanov (Arca Invierii Publishing House, Bucharest, 2011). A presentation of the book can be accessed here: http://www.edituraarcainvierii.blogspot.ro/2011/07/scara-raiului-in-cinema-kusturica.html.